Figure 7 (a) Structures of tobramycin and the 40-nucleotide RNA sequence (J6f1). (b) Structures of the 27-nucleotide RNA aptamer I and the 26-nucleotide RNA aptamer II. interaction with phosphate backbone, appear to be essential in RNA-aminoglycoside binding. Patel and coworkers [179,180] undertook an NMR-molecular dynamics study to solve the solution structure of the tobramycin complexed with two RNA aptamers. The 27-nucleotide RNA construct I (Fig. 7b) specifically binds to tobramycin (42) with affinity in the nanomolar range . These investigators solved a low-resolution structure for tobramycin bound to the RNA aptamer I . 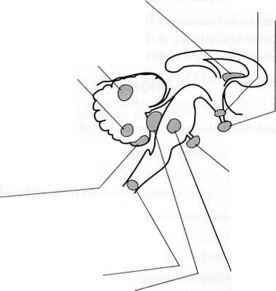 Their initial findings showed that tobramycin binds to the major groove centered about a stem-loop junction site, such that significant segments of the antibiotic are encapsulated between the floor of the major groove and a looped-out cytosine residue that forms a flap over the binding pocket in the complex. The high-resolution solution structure of the tobramycin-RNA aptamer II complex  revealed that the ring II of tobramycin is centrally positioned in the deep groove (about the G9 • A18 mismatch pair), such that its hydroxyl groups face toward the floor of the groove (Fig. 8). The 2-deoxystreptamine moiety (ring I) has its hydrophobic face directed toward the floor of the deep grove centered about the U10 • A17 and positioned closer to the C9-U10-U11 bases of the RNA construct. The amino sugar ring II, which is centered about the U12 base, interacts with the RNA deep groove through its positively charged amino group at position 2', whereas its amino group at position 6' is directed toward the milieu. The RNA aptamer II (Fig. 7b) discriminates against closely related aminoglycoside antibiotics. For instance, kanamycin B (38), which contain a hydroxyl group at the 3'-position instead of a hydrogen, as in tobramycin 42, forms a 1:1 complex with the RNA aptamer II. Whereas kanamycin A (37: replacement of amino group at the 2' -position of kanamycin B with a hydroxyl group) binds poorly to the same RNA target. Similarly, gentamicin C (51), having 3"-NH2 replaced by NHCH3, shows poor binding ability for this RNA aptamer. These findings demonstrate the importance of the amino groups at positions 2' and 3" for specific interactions with the edges of the base pairs of the deep groove of this particular RNA aptamer, which result in high specificity of binding for tobramycin. The hammerhead ribozymes, derived from self-cleaving sequences found within natural RNA replicons, are like other self-cleaving RNA molecules in that they undergo a transesterification reaction that generates the 5'-hydroxyl and 2',3'-cyclic phosphate termini. Crystal structures of two hammerhead ribozymes have been reported [181,182,183], and they have been shown to be efficiently inhibited by aminoglycoside antibiotics, particularly neomycin B (23) . The activities of the hammerhead ribozymes characterized to date are strongly stimulated by the presence of divalent metal ions, typically Mg2+, and it is suggested that competition of positively charged aminoglycosides with Mg2+ is relevant to aminoglycoside binding and inhibition . On the other hand, Murray and colleagues  have demonstrated that metal ions are not obligatory chemical participants in the catalytic reactions and self-cleavage of hammerhead ribozyme. These findings suggest that the catalytic function of the ribozyme is influenced by the folded structure of the RNA itself, as well as the presence of a relatively dense positive charge, than by divalent metal ions. Figure 8 The NMR structure of the tobramycin-RNA complex. Tobramycin is shown by the capped-stick presentation. A portion of the RNA structure at the aminoglycoside binding site is shown as a surface. 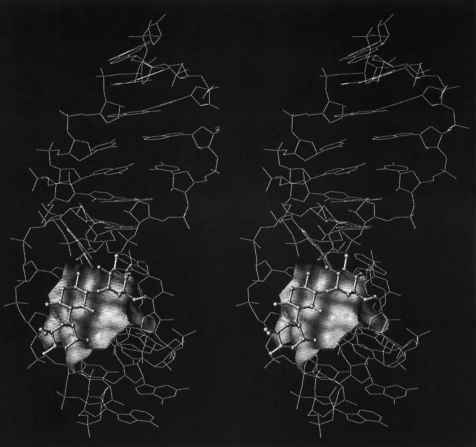 Aminoglycoside binding to the hammerhead ribozyme 16 (HH16; Fig. 9a)  was found to be specifically effective with neomycin B. Interactions of the antibiotic with the enzyme-substrate complex were suggested to reduce the cleavage rate by stabilizing the ground state and destabilizing the transition state of the complex, leading to phosphodiester cleavage. These workers studied the inhibition as a function of pH and Mg2+ concentration and concluded that the positively charged antibiotic inhibits the hammerhead ribozyme by displacing critical magnesium ions at physiological pH. Figure 9 (a) The secondary structure of the hammerhead ribozyme 16 (HH16) showing the enzyme (E16) and the substrate (516). (b) Structures of some semisynthetic and natural aminoglycosides. derivatives showed higher binding affinity for the hammerhead ribozyme than the parent compounds. 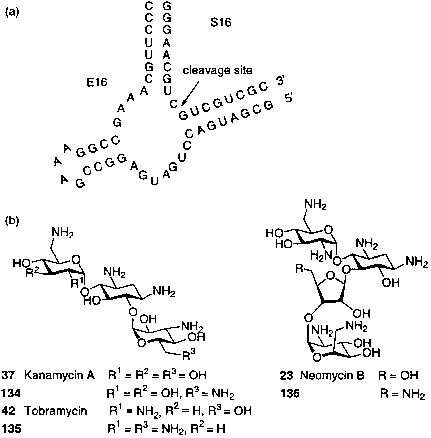 For instance, 6"-amino-6"-deoxykanamytin A (134) showed enhanced affinity compared to kanamycin A (37), a poor RNA binder, and was as effective as kanamycin B (38), a natural product containing five amino groups. Likewise, 6"-amino-6"-deoxytobramycin 135 and 5"-amino-5"-deoxyneomycin B (136) showed about fivefold enhanced binding affinities for the hammerhead ribosome, suggesting the importance of the overall charge of these small molecule ligands for RNA binding affinity. These investigators  have also shown that the binding affinities of ami-noglycosides for the hammerhead ribosome correlate with the basicity of the amino groups in these RNA binders. They compared binding affinities of two aminogly-coside antibiotics tobramycin (42) and kanamycin B (38), which have same number of amino groups (five). Tobramycin, which is 3'-deoxykanamycin B, inhibits the hammerhead ribozyme more effectively than kanamycin B itself. Therefore, the absence of a hydroxyl group next to an amino group might increase the basicity of that amino group inductively and enhance the RNA binding affinity of the compound. To probe this possibility, Wang and Tor  prepared a number of deoxygenated tobramycin analogs (compounds 137-140) and found increased inhibitory activity for 4'-, 2"-, and 4"-deoxy analogs, which involved hydroxyl group deletion on a carbon vicinal to an amino group. In contrast, 6"-deoxytobramycin (140), with hydroxyl deletion remote from an amino group, exhibited poorer inhibitory activity than the parent antibiotic. These results support the critical role of electrostatic interactions in RNA binding, indicating the importance of the basicity of the amino groups in RNA binding affinity of aminoglycoside antibiotics at physiological pH. Hermann et al. [188,189] have demonstrated that the positively charged amino groups of an aminoglycoside antibiotic are capable of displacing three or four magnesium ions located within the cavity formed by the deep grooves of stems I and II in the hammerhead crystal structure [182,183]. These workers used molecular dynamics simulations on complexes of the hammerhead RNA and aminoglycoside antibiotics and showed that the interactions between RNA and amino groups of ami-noglycosides are almost identical with the observed interactions for Mg2+ in the hammerhead crystal structure .